Following an extensive search, the university has appointed Professor Girma Y. I. Menelik as the Substantive Dean for the College of Social Sciences Theology Humanities and Education with effect from 1st September 2018. Professor Menelik holds a PhD in Political Science (University of Bremen) and an LLD in Constitutional Law (UNISA and University of Hagen, Germany), MSc. in Economics and MSc. in Informatics from University of Bremen, Germany. He also holds a Master of Arts degree in International Relations from University of California, Berkeley (UC-Berkeley-USA), LLM in International Competition Law and Policy from University of East Anglia and a Bachelor in Political Science from London School of Economics (United Kingdom). 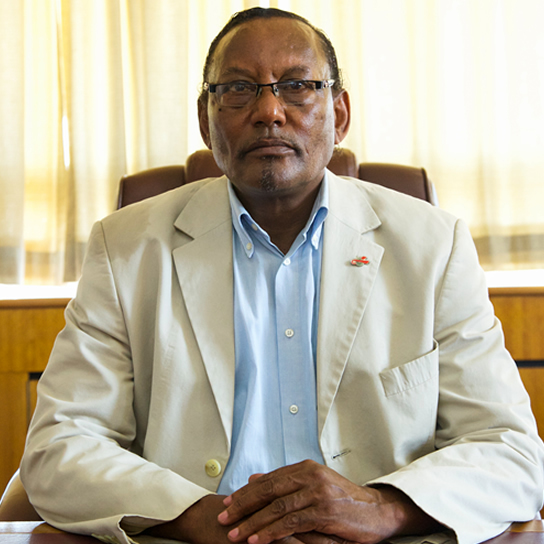 Professor Menelik has a strong leadership experience in both Academic and Non-Governmental Sectors, notable among this being his roles as College Director at Agro-Ecological and Technical College, Dean of Faculty for Political Science and Economics and Governing Board member of Bahir-dar, Meqelle and Haramaya Universities in Ethiopia. He was also a Deputy Country Representative for German International Non-Governmental Organisation (GIZ) for three years. His expertise includes creation of strategic partnerships, grant writing, managing grants and carrying out scientific research as well as Human resources and administration management. He is also the initiator and founding Board member of Adwa Pan African University at Adwa, Ethiopia launched early this year and expected to operate in 2021. His areas of interest and research range from African Economic Social and Political Environment, Comparative Politics , Civil Society in Africa, Human Rights, Refugee law, Conflict Management and Resolution, Terrorism, Sustainable Development, Leadership and Governance, Leadership and Governance , Mediation and Negotiation, Security studies including Cyber-Security , Business and natural Resource Analytics , US foreign Policy, International Competition Law, Management & Corporate Governance and International Relations and Diplomacy. Professor Menelik, who is originally from Ethiopia, was seconded from Germany to assist the Institute of Peace, Leadership and Governance IPLG at Africa University in Zimbabwe in October 2010 as a Professor of Leadership, Governance, Human Rights and Development. Prior to this appointment, he briefly held an Endowed Chair in Social Sciences and Intellectual Property. He has 25 years of teaching experience at tertiary level especially at Bremen University, University of Duisburg, Germany, Miami University in Miami Beach, FL, USA, Haramaya University in Ethiopia and at Texas Rice University. He has also 10 years of working experience with international NGOs like GIZ, MSF, IGAD and 4 years of experience as Director of Agro-Ecological and Technological Colleges. Prof. Menelik is a dedicated Leadership resource person, facilitator and coach with SEGI-University in Kuala Lumpur, Malaysia and Mahidol University in Bangkok. Thailand. Apart from several Journal Articles Professor Menelik Wrote 15 Books in English and 22 in German language and 16 books in Amharic (Ethiopic language). Africa university is poised to benefit significantly from his multidisciplinary background in leading cross functional research.